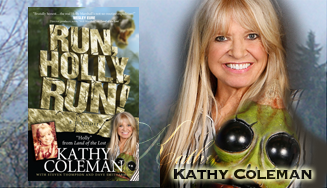 Kathy Coleman ~ Run, Holly, Runn! ﻿﻿﻿Kathy landed the role of “Holly” on the 1974-1977 NBC Saturday morning series, "Land of the Lost" produced by H.R. Pufnstuf creators Sid and Marty Krofft, featuring state-of-the-art special effects and written by some of the biggest names in literary science fiction. "Land of the Lost" was known for its intelligent scripts and original concepts—from an alternate universe inhabitated by dinosaurs, to primate-like Pakuni and lizard creature Sleestaks to dimension-hopping Pylons. It became the most successful Saturday morning program of the decade. When the series ended, her show business career slowed to a halt and her attempts at living a “normal” life were less than successful. Turns out, being chased by dinosaurs was the easy part—Kathy spent the next two decades fending off two abusive husbands, raising two young sons, enduring homelessness and jail time, and trying not to lose her way. Shooting commentaries for the "Land of the Lost" DVDs, and a cameo for Will Ferrell’s 2009 big screen "Land of the Lost," brought Kathy out of hiding. Energized by the belated discovery that hundreds of thousands of fans never forgot her as the plucky Holly, Kathy used their energy to find a spiritual calm, fix some negative aspects of her own life, and become an upbeat and popular guest at celebrity events throughout the country. ﻿Being chased by Sleestaks was the easy part! ﻿The funny, but harrowing, true story of former child actress Kathy Coleman—who starred in the hit 1970s show Land of the Lost. Kathy grew up fatherless in Southern California in the 1960s as the last child in a family of ten children. Her bright smile and blonde curls got her into television commercials at a very young age, and by the time she was 10 she was touring the country with a popular musical group. Land of the Lost was known for its intelligent scripts and original concepts—from an alternate universe inhabited by dinosaurs, to primate-like Pakuni and lizard creature Sleestaks, to dimension-hopping Pylons. It became the most successful Saturday morning program of the decade. When it finished its network run, the show went directly into syndicated reruns that continue to this day. The book’s title is taken from the oft-repeated instructions of her TV brother, Will, played by Wesley Eure. Learn what happened after the series ended!